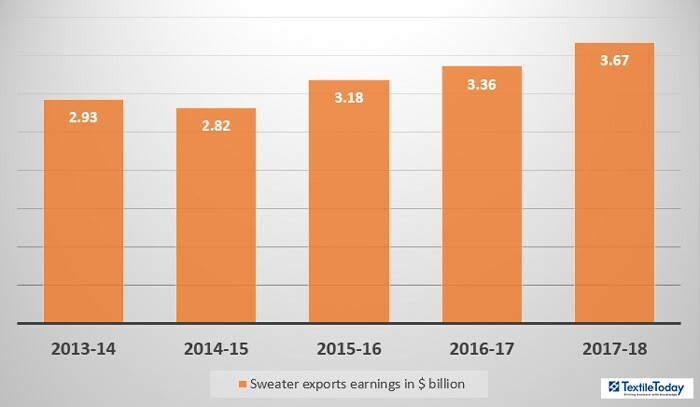 Sweater has contributed 11.98% to overall readymade garment exports of $30.62 billion. In the Fiscal Year 2017-18, Bangladesh’s export earnings from the apparel sector have seen an 8.76% growth to 30.61 billion. While, the country’s total, exports earnings rose to $36.66 billion in the same period. Bangladesh, the second largest exporter of clothing products, has a huge opportunity in increasing exports of sweater products, as it is upgrading technology. While the global demand is increasing due to expanded winter in the Western world. On top of that, Bangladesh offers quality products at an affordable price. These have pushed the export earnings from the sector up.